House Republicans might be discussing a proposal that would strip party members of their committee assignments if they vote against the party’s candidate for Speaker on the House Floor in January, National Journal reported on September 19. We have no knowledge as to whether or not the GOP Conference will consider this rule change, but they should. The Constitution requires the Members of House to elect a Speaker at the start of every Congress. Before Congress convenes, the Democrats and the Republicans each meet privately to select their candidate for the job, and any Member may nominate anyone for the job, even someone who is not a Representative. Then when Congress opens, on the same day the Members are sworn in, the election for the Speakership is held. It is one of two votes during a Congress that must be held by a call of the roll, rather than voting by electronic device. (The other such vote occurs when the House is called on to select the President when no candidate gets a majority of the Electoral College). There has rarely been much suspense, as the majority party typically elects its candidate on a party line vote. Every so often, however, the elections for Speaker can become a little interesting. Once, after the election of 1916, a handful of progressive “Bull Moose” Republicans broke ranks and helped elect a Democrat as Speaker – the only time the party that had won the most seats did not get their candidate for Speaker elected. During the long Republican drought from power, when the Democrats controlled the House for all but two non-consecutive Congresses from 1932 to 1994, there had been some talk of inviting a handful of conservative Democrats to join the Republican minority and elect one of the conservative Democrats as Speaker in exchange for Republicans chairing most committees. Nothing came of that, as palace rebellions are usually quelled when would-be insurgents reflect upon the admonition, “If you are going to shoot the King, you had better not miss.” A lot of moving parts would have to occur in absolute secrecy for a coup like that to occur – and Washington is not a city known to be conducive to moving parts or secrecy. Certainly there have been some protest votes from time to time. Every year, some congressional outlier will vote for someone else during the election of Speaker. For instance, after the Democrats lost the House in the 2010 elections, conservative Democrat Heath Schuler ran against Nancy Pelosi to be their Caucus’ Minority Leader and, by extension, candidate for Speaker. Schuler lost to Pelosi 150-43, in a surprising show of strength by the Blue Dog Democrat coalition. However, when the election for Speaker was held at the beginning of Congress, only 11 of Schuler’s supporters voted for him and Pelosi received 173 votes on the Floor, a comfortable majority of the Caucus. Due to defeats and retirements, only 1 of those 11 Democrats will be raising his right hand when the 114th Congress convenes. Although the plot failed, there is a chance that there might be a repeat performance in the next Congress as well. Judging from the musings of few far-right activist groups, there will be some movement to run a candidate against John Boehner in the Conference election. For example, The Hill recently reported that a number of House conservatives “have been secretly huddling inside and outside the Capitol, plotting to oust” the Speaker. Failure to support the party’s candidate for Speaker would throw the House into a major crisis. A Speaker must receive a majority of the votes of the House. So during the last mutiny attempt, Nancy Pelosi, who finished second in the balloting would have won only if these Republicans voted for her – in which case they would have presumably been switching parties and caucusing with the Democrats, but there was absolutely no chance that these most conservative Members of the House would have done so. If no candidate receives a majority then the House would proceed to a second ballot, and keep going until someone received 218 votes. Nothing can get done, no committees can meet, and no legislation can be considered until the Speaker’s election is settled. In the upcoming Congress, a Floor battle for the Speakership launched by a small fraction of the Republican Conference would dramatically undermine any legislative momentum that would come if Republicans capture the Senate. Clearly, the majority of the Conference is not going to suddenly cave to a small band of malcontents and give them the opportunity to name a new Speaker. So the party might have to spend the first three or four weeks battling over who will be Speaker, which would take away precious time from legislating. Ideally, House and Senate Republican majorities would line up a series of legislative initiatives to pass in the first six months that would create a positive and appealing agenda for the public to consider going into the 2016 elections. If instead the Republicans had a protracted battle over the Speakership, all of this momentum will be lost. Aside from halting the party’s momentum, the person who would benefit most from such an embarrassing display of political weakness would be Nancy Pelosi. 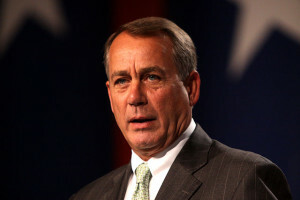 How ironic would it be for extreme conservative members to place the former Speaker in a position of powerbroker? While John Boehner could never make a bargain to get Democrat votes in exchange for his Speakership, the longer the balloting goes, the likelihood of a deal to get enough votes for a subsequent candidate grows. What would the Republican majority have to give up to get the handful of Democrat votes needed to elect a Speaker? For her part, the Democratic Leader would have no real interest in helping Republicans out of their dilemma. Such a political disaster would only serve to enhance her opportunity to return to the Speakership on her own steam following the 2016 election. All in all, partisan Democrats would be downright giddy, even if, for propriety’s sake, they publicly expressed dismay at the inability of the House to organize. Aside from the practical ramifications just mentioned, such revolts mean that a very small percentage of Members are thwarting the majority’s will in a body that is emphatically majoritarian. At the beginning of this Congress, had the dissenters successfully garnered 12 votes to deny Boehner the speakership, they would have been denying the will of the other 217 Republicans in the Conference. That’s 5 percent of the Conference blocking the will of 95 percent of the Conference. In the next Congress, if Republicans get to their stated goal of 245 seats, Boehner would have a larger margin to play with than he had in 2013. It would take 28 Republican members voting for someone other than John Boehner to defeat the choice of the other 217 members of the Conference – a little closer to 11 percent of the Conference. Obviously, every seat fewer than 245 makes the margin slimmer, but that also means smaller and smaller percentages of the Conference would be impeding the will of the majority. That doesn’t exactly sound like a triumph of democracy as much as a display of bad temper by those who could not defeat Speaker Boehner in an open Conference ballot. In the face of such a legislative meltdown, the Conference could pass a rule to punish those who vote against the party’s candidate for Speaker. The most likely consequence would be the loss of committee seats, a restriction to only serve on lower priority committees, or perhaps a ban on leadership positions within the House, such as subcommittee chairmanships. We think the Conference would be justified if they adopted such a punitive rule, to sanction members who undermine the wishes of the majority. The rebellious minority’s actions amount to little more than an attempt to undermine the will of their colleagues following the loss of their candidate in a fair and open Conference election process. This, of course, points to the first argument in favor of such a rule. There can be little doubt that if their candidate actually surprisingly won the party’s nomination for Speaker against John Boehner that these same people would be the first ones urging party unity on the House Floor in January. Realistically, this band of dissenters should also bear in mind that Speaker Boehner, beloved though he is by most of his GOP colleagues, will not be Speaker forever. There will come a Congress where he decides to step down creating an open race for Speaker. Given the nature of the party, there will likely be a vigorous race or the post. If the Tea Party-aligned members were to successfully nominate one of their own, they would want the Conference to stand behind their choice, right? “You betcha,” in the words of one of their heroines. Their opposition to Speaker Boehner this year would provide an excuse to every Republican on the losing side of a future election to block their choice from gaining the 218 votes needed on the floor in a new Congress. So the first reason for all Republicans to support the rules change is enlightened self-interest. As we’ve pointed out before, the rules are a two-way street: Some days they disadvantage you, but other times they guarantee your victory. Although the nature of the legislative process suggest adopting such a rule, a conservative might argue that it would unfairly discourage Members from a show of principle by voting against Speaker Boehner on the House Floor. However, a vote of principle implies that there is a consequence to the action – that a person of honor, being incapable of any other course, would risk losing something of value, rather than compromise their principles. Well, this rule would provide the consequence to their principled stand. If there is no consequence, it is not principle on display, but merely showmanship. If a Member still opposed the party’s will even with this rule in place, their stand would be respected as a more politically courageous act indeed. None of this is to say that the variously styled Tea Party, conservative or libertarian Republicans should not be allowed to advance their own candidate for the Speakership at the party’s organizing conference. The Republican Conference should absolutely welcome a wide-open process for choosing its candidate for Speaker, since the leaders should serve the party, not the other way around. Once that vote has occurred, however, the Conference has the right to expect all of its members to support the Conference’s choice. Legislative politics is hardball – with its share of high and tight fastballs. These are the kind of fights where the most experienced politicians use their well-honed talents to battle for positions of power and the ability to control the legislative agenda. The process is ugly, but the consequences enormous. A successful effort by a handful of party extremists in January would be an existential threat to the Republican Party, and a potentially fatal blow to the country’s already waning confidence in Congress. If conservatives have any hope of shaping the legislative agenda for the next two years and beyond, they should keep their dirty linen in private and show a united front to the public when the 114th Congress begins in January.